“Snook Alley” is a portion of the Intracoastal Waterway near Venice (15 miles south of Sarasota) that is legendary for night snook fishing. 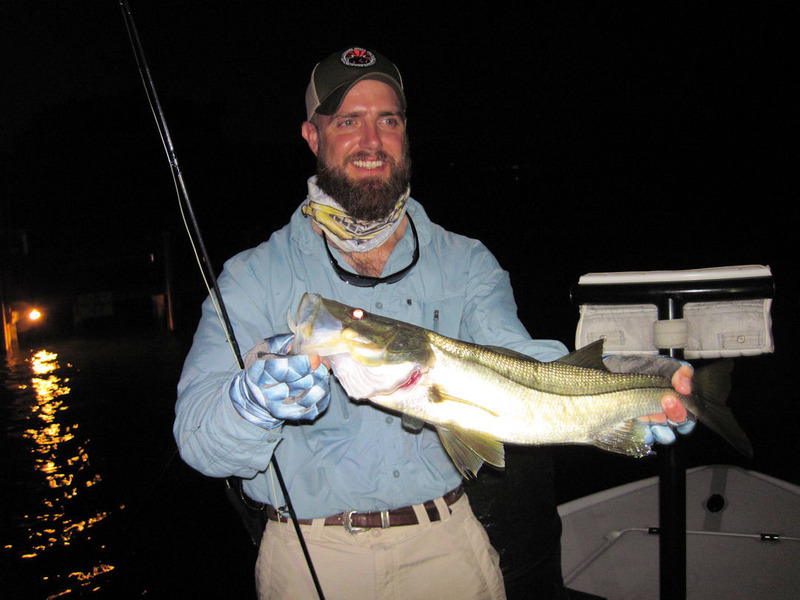 Many anglers and outdoor writers maintain it has one of the largest populations of snook found anywhere in the state of Florida. 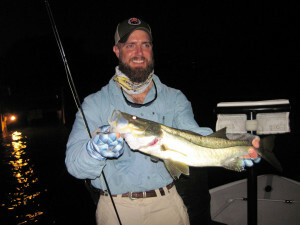 Much of the night snook fishing is around lighted docks and bridges. Large numbers of snook gather around these structures to feed on the baitfish and shrimp that are attracted to the lights. It’s one of the few examples of being able to know where these elusive fish are at a given time. Their night time habits revealed, it is easy to plan a night snook fishing trip and for a change, stack some odds in the angler’s favor. Tom Files, from McIntosh, FL, beat the heat last July by catching and releasing snook before dawn and tripletail later in the morning on flies while fishing in Sarasota with Capt. Rick Grassett. Capt. Rick Grassett file photo. This is an excellent area to flyfish for snook, which is one the most productive techniques we use. Some of the best sport the coast has to offer, fooling these battling line-siders on fly tackle has be be experienced if flyfishing is your game. We also fish this area with spinning tackle and artificial baits as conditions dictate. It is night sight fishing that can be fast and furious, even in the dead of winter. So keyed in on the bait attracted by the lights, these hungry snook are willing to pounce on your bait and they ignite like a powder keg when hooked. Hang on, because aerial flips and acrobatics are the norm and it’s a thrill to see. We also sometimes catch ladyfish, trout, redfish or mangrove snapper, depending on the way we are fishing. All these species are drawn to the docks the same as the snook, as they search for a night time snack of their own. These trips are 4 hours in length in the evening . Night snook trips are limited in availability due to daytime bookings so just inquire about putting together one of these night raids. I alos off combination snook/flats or snook/coastal gulf trips which may start before dawn and fish into the morning or start in the afternoon and fish until after dark.